By Hauraki Island Branch member, Rob Brennan. 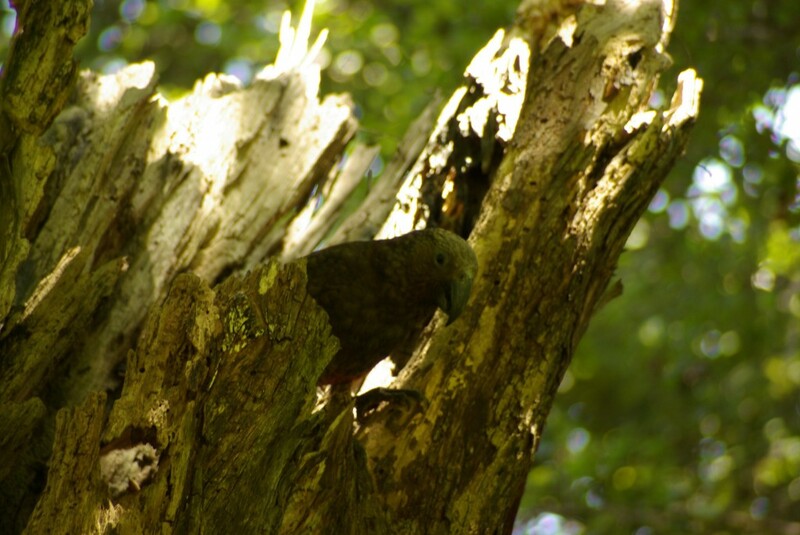 A good news story from the Hauraki branch of Forest & Bird – kākā are breeding on Waiheke Island! Not only that, but they have chosen Onetangi Reserve, a 56 hectare reserve that Forest & Bird has owned and been looking after since the early 1960’s, to make their nest. For the last two to three years kākā have self-reintroduced to Waiheke Island from (we presume) Great Barrier Island or Little Barrier Island. We wanted to know if they were actually breeding or just visiting from outer gulf islands so asked members and the public through our branch newsletter and local magazines to report sightings to us from spring 2015. We had a great response – in some cases flocks of 7 and even 10 were sighted. Then some good luck came our way when an aware person, Mark, was walking in Onetangi Reserve and saw a kākā emerge from a hollow tree trunk. He contacted active Forest & Bird members on the island, Lincoln Jackson and Hue Ross, and the nest site was quickly verified. Hue (a Forest & Bird branch committee member) then set up a monitoring team of eight dedicated people who observed daily sightings of the parent birds entering and leaving the nest tree. The team also set up more rat bait stations and DOC 200 stoat/rat traps in the immediate vicinity. As the nest tree was near a walking track we closed that section. We used our branch newsletter and publicity in the Gulf News to get the word out to the public that kākā were nesting in the reserve and that anyone walking in the reserve had to keep their dogs on leads and we asked that cats be kept inside at night. We also put up signs at the entrances to the reserves notifying that kākā chicks may be on the ground and dogs must be on leads. Disappointingly there has been at least one occasion when that clear and necessary requirement has been ignored by a dog owner. Her response, when one of our monitors pointed out her failing, was “my dog would never attack a bird on the ground”. In fact instinct is a powerful thing and even a small house dog is fully capable of wiping out months of rearing in a few uncontrolled seconds. During December and January we were becoming more like expectant parents as each day went by and we waited for the fledgling chicks to leave the nest tree and spend time on the ground. The kākā parents were observed visiting the nest on an average of once an hour to feed their young. Finally on 31 January two chicks emerged from the nest tree and for the next 9 days perched in a nearby large pohutukawa tree in amongst the epiphytes and shrouded often by foliage from a nearby and overlapping kohekohe tree. The parents continued to feed the chicks during this pre-flight phase. Once the chicks emerged from the nest we set and baited live capture cat traps and conferred with the local RSPCA before doing this. No cats have been caught. The kaka chicks in the Onetangi Reserve fledged on Sunday 31st, this video was shot on the same day. Today, Friday, they are both still in the area, up in the canopy and being fed and preened by their parents. We think the chicks have now moved away and may be achieving a degree of flight as they have not been sighted in the last two days but our monitors are hearing them from a distance – do we need an update to this? 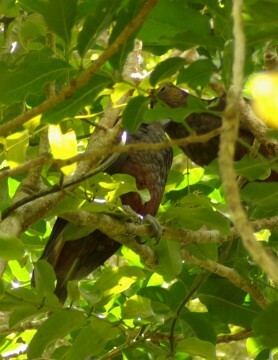 We are now aware of another kākā nest on Waiheke Island. It is on private property near the Onetangi Reserve. Fortunately the owners are eco-aware. They got in touch with Hue and he has been assisting them with regard to predator traps and bait stations. Indications are that this separate clutch are also progressing to a successful fledging. Great news. Observing a flock! Isn’t this the 21st century. This evening (30 November) we saw a kaka flying down the gully between Jellicoe Parade and Wellington Rd in Surfdale. There is also a small group of kaka very active (and noisy!) in the Hekerua Valley. Hi. We are at the bottom end overlooking Patio Bay. Saw a kaka fly over the garden / bush this morning. Never seen one before so very excited! Would be keen to talk to someone about what we can do to support them if they’ve made their way down the island. This morning I saw a single kaka flying over my orchard in Church Bay Rd. It was gliding in the strong wind. Very pretty and very exciting for me! Just saw the flock of Kaka (7-9 of them) up near WISCA by top of Park road. Such a wonderfully rewarding thing to see a species recovering habitat to some extent. Good work all! We are at the bottom end. Have seen 2 pairs regularly flying over the garden. We have approx 8 hectares of bush and little building. Love to know if they are nesting or just visiting! Have seen now for two seasons.